2019 Lobby Rankings. Texas Lobby Group boasts three professionals among the top-ranked “hired guns:” Mike Toomey at number 1, Lara Keel at number 6, and Carrie Simmons at number 41. Recent addition Alec Puente also ranked on Capitol Inside’s “Rising Stars” list at number 20. Mike Hailey, 2017 Texas Lobby Power Rankings, Capitol Inside, Jan. 25, 2019. Property Tax Reform. On Thursday, Governor Greg Abbott, Lt. Governor Dan Patrick, and Speaker Dennis Bonnen jointly announced their support for the Texas Property Tax Reform and Relief Act, filed as SB 2 in the Senate and HB 2 in the House. Among other changes, the Act would lower the rollback rate from 8% to 2.5% and require an automatic ratification election if the rate is exceeded for taxing units collecting more than $15 million in annual revenue. House Democrats responded with a press conference urging lawmakers to move cautiously and consider the impacts of the proposal on public education funding. Special Elections. Two House Districts held special elections on Tuesday. In El Paso’s HD 79, Democrat Art Fierro defeated Mike Noe to fill the term of former Representative Joe Pickett (D-El Paso). Fierro is a marketing professional and the Chairman of the El Paso Community College Board. In Houston’s HD-145, Democrats Christina Morales and Melissa Noriega advanced to a run-off election from a field of eight candidates. The governor is expected to call a date for the run-off soon to fill the term of Rep. Carol Alvarado (D-Houston), who was elected to the Senate in November. Finally, early voting began on Monday in San Antonio’s HD 125 to select a replacement for Rep. Justin Rodriguez (D-San Antonio), who was appointed to the Bexar County Commissioners Court. Four Democrats and one Republican are running in the election to be held February 12th. State of the State Address. 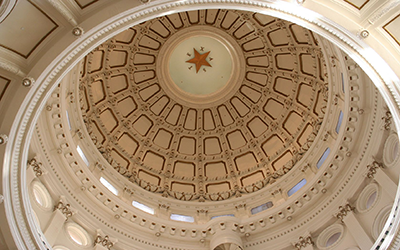 Governor Abbott will deliver his State-of-the-State address to a joint session of the legislature on Tuesday, February 5, 2019. During this speech, the Governor will declare emergency items that will not be subject to the 60 day moratorium other bills must adhere to. For more on these topics and other information about the legislature, see www.capitol.state.tx.us.